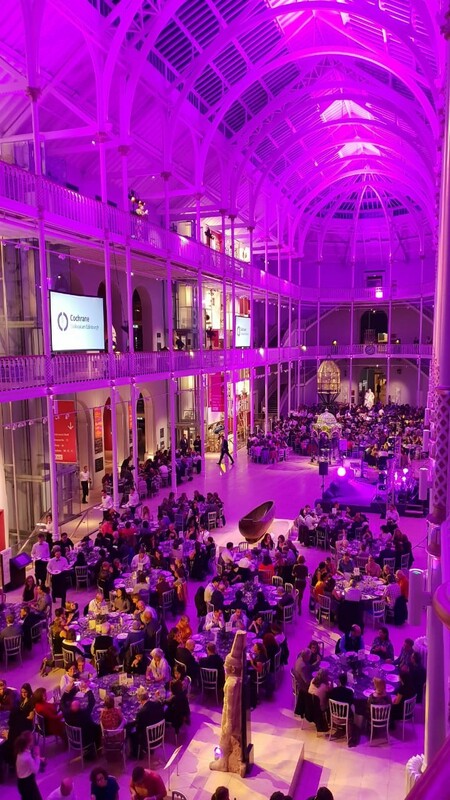 The EQUATOR Network Education and Training Manager, Caroline Struthers, has just received the Cochrane-REWARD Prize from the hands of Sir Iain Chalmers during the gala dinner of the Cochrane Colloquium, on Monday, September 17th, in Edinburgh. 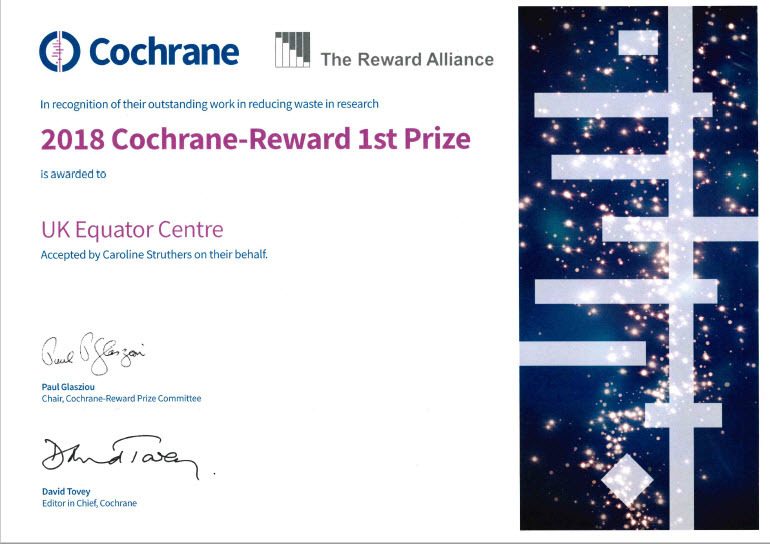 The prize was created to recognize good local or pilot initiatives to reduce waste in health research, either in question selection, study design, research conduct, publication, or reporting. 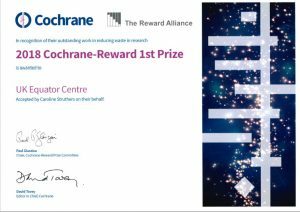 Struthers was rewarded for her work in the UK EQUATOR Centre building GoodReports.org, and for her collaboration with Penelope.ai to test the tool in a journal submission workflow. GoodReports is an online easy-to-use and free wizard that guides researchers to find very quickly the correct reporting guidelines for their studies and improves accessibility to them. 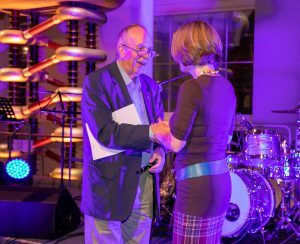 While happy for the recognition of the initiative, during the event Struthers and many others missed Douglas Altman, the EQUATOR Network founder and leader, who passed away recently. “As you can imagine, Doug Altman was extremely helpful and supportive to me and James Harwood as we were developing the GoodReports online tool, as were all of the UK EQUATOR Centre team. I hope we can do him proud and scale up GoodReports so that all health researchers will be able to find and use reporting guidelines more easily to help reduce the waste in research caused by poor reporting”, she said. “This award is not only great recognition of the fantastic work Caroline and James have done to help researchers find relevant reporting guidelines, but it also showcases initiatives within the UK EQUATOR Centre to improve the reporting of biomedical research”, said Gary Collins, the director of the UK EQUATOR Centre. Harwood is the founder and CEO of Penelope.ai, and an EQUATOR fellow. Penelope.ai is an online tool that automatically checks academic texts for common fixable errors such as a missing ethics declaration, incorrect figure legends, missing references, lack of abstract headings, or failure to attach a completed reporting checklist. In January 2018, Penelope.ai’s manuscript checker was adapted to incorporate the EQUATOR GoodReports tool, and direct authors to a suitable reporting checklist when appropriate. The Penelope.ai tool is now offered to authors submitting papers to the BMJ Open journal, while the GoodReports is available for all in www.goodreports.org. The war against the waste in research needs to improve its arsenal continuously. The EQUATOR Network expects that GoodReports will be adopted and endorsed by dozens of scientific journals in the following years, increasing the awareness of reporting guidelines and their usage. By developing a relationship with researchers submitting papers to these journals, it will be possible to improve the online tool to include new guidelines and educational materials and to spot cases where no guideline is available. “With direct feedback, we will be able to track how understandable and usable authors find each checklist. We will be able to identify common problems quickly and work with reporting guideline developers to make improvements”, hopes Struthers. As the adherence of authors to reporting guidelines is still low, the EQUATOR Network created GoodReports, an online tool designed to lead them directly to the guideline that is appropriate to each study. All the researcher has to do is to answer a few questions online and the tool’s algorithm points to the best reporting guideline to use. “Given that so many different reporting guidelines exist this is an invaluable tool in helping authors to quickly and easily locate the correct guideline for reporting the research that they have conducted’”, says Shona Kirtley, the EQUATOR Knowledge and Information Manager. “The GoodReports algorithm makes a recommendation of a reporting guideline to use that is accurate in more than 80% of the cases”, states Struthers. “It has been used by thousands of authors since January, 2018, and we are collecting their feedback to improve the tool”. The users so far reported that GoodReports usefulness as 8/10 in 86% of cases. Penelope.ai is another online tool aiming at checking manuscripts automatically for some key content items that impair research transparency or integrity. For example: it checks whether there is an ethics statement in the article – and this prompts the authors to fix it if absent. Penelope.ai is under evaluation currently, but preliminary data shows that authors using Penelope.ai are more likely to include a reporting guideline checklist in the manuscript submission. The EQUATOR Network was established in 2006 by Doug Altman and colleagues to help coordinate the efforts to improve the quality and reporting of health research. EQUATOR bring together tools and resources to facilitate good reporting in one place, including a comprehensive database of reporting guidelines for all types of health research. For more information on the EQUATOR Network and the GoodReports initiative, please contact Caroline Struthers.